I was supposed to have read this for another 50 book club shared read, but I didn't get done in time to join in the discussion, which you can find over at the Mount Benson Report. I was very hesitant going into this book. 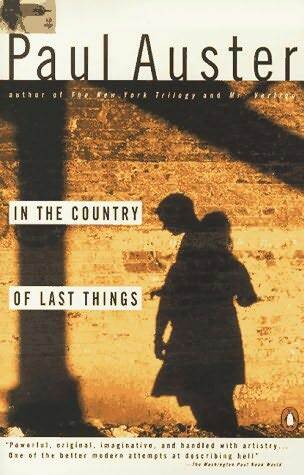 I recognize that Paul Auster is a very talented writer, with interesting ideas and situations. But everything of his that I have read always seems to have that slight distance from the narrative that renders his work very attractive to pretentious college students. I'm pretty basic in my literary needs and I like a strong story, well-grounded into some setting. Auster seems to like ideas. The idea of this book, I think, is hope and despair and the collapse of modern civilization. He does a good job of capturing the feel of a society without laws or goods, but still held together by the bare bones of its original infrastructure. He also comes up with a lot of cool and weird situations, like the scholars all barricaded in the library and the competitive world of the scavengers. But ultimately, it is not connected to anything real. There's no actual nation, no real city name given, no history. And it gives me this suspicion that he's trying to tell me something and I'm supposed to figure out. Like what is the role of the Jews in the book. So while I actually enjoyed most of the book, I never really got caught up in it because I kept wondering what was the point of this and the point of that. I left that kind of practice for the Lit majors back in college. Not a bad read, but not really for me.